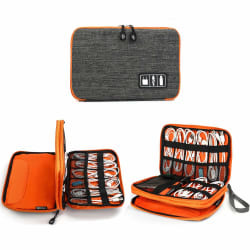 Jelly Comb Direct via Amazon offer its Jelly Comb Medium Electronics Organizer in Orange/Gray for $13.99. Coupon code "4BKEZH9E" cuts that to $9.79. With free shipping, that's $4 off and the lowest price we could find, although we saw it for a buck less on Cyber Monday. This waterproof nylon case measures 9.8" x 6.5" x 0.8" and features a 7.9" tablet sleeve and multiple mesh cable pockets. Deal ends January 15.